If you've ever thought about lowering the back end of your VW Beetle, this is the video for you. Follow along as we show you step by step how to lower the rear end of a vintage Volkswagen Beetle. There are no parts needed to swap out for this one, just a handy set of tools. This is a great and simple DIY project for you to do at home. Disclaimer: Use extreme caution when removing the spring plate, as it is held under extreme tension. We highly recommend clearing the area below the Spring Plate of any tools, debris and make certain to stay clear of moving parts during removal. When the Spring Plate clears the housing it will release downward with an extreme amount of force and may cause injury if proper precautions are not taken. Hello, I'm Sam with JBugs.com. With the front end on our 1963 Resto Custom Beetle lowered, we're going to get to work on the rear end. First, we're going to be lowering the rear by resetting the spring plates. The rear suspension is completely adjustable from the factory so unlike the front, where an adjustable beam or drop spindles are needed, no parts are required to lower or raise the rear suspension. We will be replacing the [rear] spring plate bushings and the rear shocks, just as a portion of restoring the car, not out of necessity. Getting started, the front wheels are chocked. The lug bolts on both rear wheels are loosened. The rear end of the car is jacked up and set on jack stands under the torsion housing. The rear wheels are removed from the car. The rear shock is unbolted from the axle tube at the bottom and the shock tower at the top and removed from the car. The axle tube is unbolted from the spring plate and the bump stop plate is removed and set to the side. To get the axle clear of the spring plate, inside the car the emergency brake cables are removed from the handle by un-threading the nuts and pushing the cables down clear of the handle. Back at the rear of the car, the emergency brake cable is pulled out of the chassis a bit and the axle is rotated clear of the spring plate and re-supported. Next, the spring plate cap is unbolted from the torsion housing. With the cap removed, the spring plate can now be popped off the torsion housing. Use extreme caution, as the torsion bars can hold an extreme amount of energy and when unloaded, that energy will force the spring plate down, sometimes quickly and unexpectedly. Do NOT pry the spring plate from the bottom side, as once the plate is clear of the housing, it may shoot down. Keep the area below the spring plate clear of tools and body parts. With the spring plate unloaded or free of the torsion housing, we mark the angle of the spring plate on the housing so that we have a reference point if we were going back to stock height. The spring plate is pulled from the torsion bar, using caution to keep the bar in the torsion housing. The torsion bars have different splines on the inside and the outside so that the suspension can be adjusted in as little as a quarter inch increments. By turning the bar on the inner spline one tooth in one direction and one tooth on the outer spline the other direction. We're going to be doing a fairly dramatic drop, turning the spring plate two teeth on the outer splines which should drop the rear end roughly five inches. With the spring plate removed, the old bushings are removed from the cap and the torsion housing and a new bushing is installed on the inner portion of the spring plate. The spring plate is set back in place on the torsion housing noting our scribed mark. We pivot the spring plate up while feeling the teeth on the splines on the torsion bar, moving the spring plate up one spline at a time, two splines total, and pushing the spring plate onto the torsion bar and into the housing. The spring plate will be hard to press in fully because of the new bushings so; we hit the spring plate a bit with a hammer to get it to sit in place a bit more. Another spring plate bushing is set on the plate, followed by the spring plate cap. Bolting the cap down will be difficult because of the new bushings. Start by threading in the rear lower bolt a few threads. A center punch is used to pull the spring plate up at the rear upper bolt hole while threading in the lower front bolt. A temporary 40mm long bolt is threaded into the upper rear hole and bolted down. The upper front bolt can be installed and all three of the factory bolts can be tightened. The temporary bolt is removed and replaced with a factory bolt which is tightened down as well. If you are reusing the bump stops, it's recommended to trim the height down to allow for some suspension travel with the lower ride height. In extremely lowered cars the plate is often left out completely. We're going to be trimming the bump stop and set it in place on the plate and set the plate in place on the axle tube so that the axle tube can be bolted to the spring plate. Make sure to slide the axle tube all the way forward in the spring plate notches before tightening the bolts. Next, we will install new KONI classic adjustable shocks which we set at a medium firmness one full turn from the softest setting. Bolt the shock to the axle tube at the bottom and the shock tower at the top. Our rear tire selection is much taller and wider than stock [at] 215/70R15, it's mounted to a 6.5" wide EMPI gloss black BRM wheel. The wheels are mounted onto the wheel with EMPI studs, which are threaded into the drum followed by the wheel and the lug nuts. The whole process is repeated on the other side. The back of the car is jacked up, the jack stands are removed, and the car is set on the ground. The back of the car is now sitting much lower than stock. Once the front springs settle in, we'll readjust the front to get the stance we're looking for. If we weren't going to be installing rear disc brakes in our next step, the hand brake cables would be re-attached, the lug bolts would be tightened, and the job will be complete. In the meantime though, we're going to get the back of the car back up in the air and swap out the drums for disc brakes. That will be in our next video though, so stay tuned. 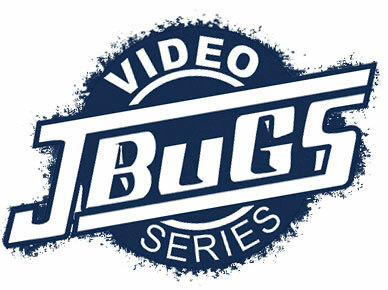 Thanks for watching and stop by JBugs.com for your vintage Volkswagen suspension parts and accessories.